Two Christian student groups that were derecognized by the California State University system last year have been allowed to return. It came at a steep price, though: They have agreed in writing to let non-Christians run for elected leadership positions in each chapter across CSU’s 23 campuses. That “writing” provision is important. An official with InterVarsity Christian Fellowship told The College Fix that leaders of other religious groups have told him they wouldn’t allow students who aren’t their own believers to lead their groups, but they won’t say so publicly. CSU’s dispute last year with InterVarsity and Campus Crusade for Christ, also known as Cru, involved faith-based rules for leadership in the groups’ bylaws. An executive order in 2011 by then-Chancellor Charles Reed required CSU student groups to allow anyone to run for leadership positions even if their beliefs conflict with that of the organizations. Colleges won the legal right to enforce “all comers” policies in a 2010 Supreme Court ruling. 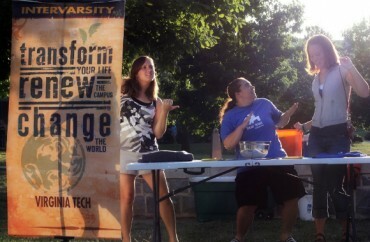 When they were derecognized after refusing by change bylaws, InterVarsity and Cru not only lost campus visibility but saw their operating costs skyrocket and attendance plummet as more events had to move off-campus, as The Fix reported in February. In particular, the clubs had to pay steep rental fees for rooms on campus that are free of charge to recognized student groups. The all-comers order applies to “all student groups on our campuses, not just religious groups,” Toni Molle, CSU director of public affairs, told The Fix by email. Yet CSU has acknowledged that fraternities and sororities aren’t required to comply because of federal law. CSU had an extensive conversations with InterVarsity and Cru but gave them no leeway on the order, Molle told The Fix. InterVarsity and Cru declined to tell the Times exactly what they changed in their bylaws. CSU’s message to InterVarsity was that “as long as every student has the right to apply and be considered, they would be satisfied,” and InterVarsity would be satisfied “as long as our students are free to ask questions during the selection process about faith, missions and message,” Jao said. Cru similarly said it could continue work at CSU without compromising its Christian principles. “After lengthy interaction with the office of the Chancellor we are confident that our student leaders will be men and women who are able to live out our historical mission without compromise,” Mark Gauthier, vice president of campus ministry, told the Times. Cru did not respond to Fix requests for comment. Organizations and clubs are required to share their bylaws with their CSU campuses on a yearly basis, Molle told The Fix. They must submit “documentation demonstrating that they do not discriminate in membership or leadership,” she said. “Our selection process welcomes everyone, and it does evaluate whether students can lead our religious activities, advance our religious mission, and communicate our religious messages faithfully,” Jao told The Fix in an email. While InterVarsity cannot require its leaders on CSU campuses to be Christian, InterVarsity Christian Fellowship/USA does mandate that leaders of affiliated student chapters affirm the group’s “doctrinal basis,” Jao said without elaborating. CSU’s reliance on bylaws meant that religious groups that didn’t codify their leadership requirements could continue discriminating against students who didn’t belong to their own religion, Jao told the Times. Asked to elaborate by The Fix, Jao said he’s heard similar sentiments from other religious organizations but declined to name them. The Fix also reached out to the Muslim Student Association and Sikh Association at San Jose State University and Muslim Students Association at CSU-Long Beach to ask whether their policies unofficially frown upon student leaders outside of their faiths, or whether they knew of other student groups in their faith with such unofficial policies. None responded. Jao told The Fix an all-comers policy “actually undermines diversity on campus by pressing minority groups to assimilate,” which “doesn’t achieve the safe, welcoming, tolerant environment we all want. “Non-discrimination policies should protect, rather than penalize, religious groups that want to remain faithful to their religious traditions,” he said. UPDATE: This article has been amended to include comment from the Sikh Association at CSU-Long Beach.